Follow these tips to give your ZBrush work that Hollywood finish. The power of ZBrush means that by following some tutorials and getting in plenty of practice, any budding 3D artist can soon produce great-looking results. However, if your aim is stunning results that are suitable for the big screen, then you're going to have to up your game a lot. 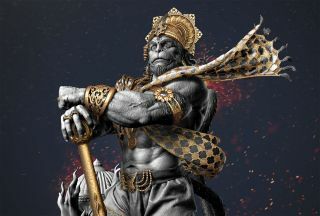 To help you out, we asked three A-list artists – Maarten Verhoeven (tips 01-05), Gaurav Kumar (tips 06-10) and Madeleine Scott-Spencer (tips 11-15) for their pro tips on getting the most out of ZBrush to produce work that stands apart from the rest. Here's what they had to say. A very basic but important thing to do is set your work screen in a way that lets you utilise it fully. Go to Document in the toolbar and set the size of your document monitor resolution to make sure there are no unused areas. You can also change the ZBrush screen from grey to gradient black for a consistent background screen. Thirdly, I would suggest that you change the material from MatCap Red to MatCap Grey or basic grey material. This is a very effective way to increase the speed of your work. Go to Preferences in your toolbar, select Config > Enable Customize. By pressing ctrl+alt you can move any button, pallet or brush onto your ZBrush interface. Once you've added your most-used brushes and options to your UI go back to Config and click Save UI and Store Config. This will help to make your creative process easier and faster. This is a great way to move quickly from one angle to another. When working on a large model it becomes difficult to see it from all sides, so you can go to Movie in the toolbar and under Timeline turn on Show. This will put the timeline camera on the top of the screen, so you can position your model and click on the timeline to add a keyframe. This can be done in any position that you may need to see again or work on quickly, and you can move through them quickly using the arrow keys. Create most of the shapes of the model in the lowest subdivision so that the forms can be made correctly with the least poly. It's much easier to manage and edit a lighter mesh than a heavy one. Always try to sculpt in the same flow of muscles or skin to make the model look real. Transpose is a smart tool for masking certain areas of your model. If you hold ctrl then click and drag the model, you can mask with the Transpose Smart brush. It will look at the surface and mask the rest of the area, leaving any raised spaces, as seen in the image. Go and search Ryan Kittleson's Macro script. It could save you some time when sharpening up your sculpted details. Install the script and find it in your Macros folder, then sit back and let it work its magic. You can use Sculptris Pro to add details to your already-decimated models; instead of re-DynaMeshing your prepared sculpt, just go in again with Sculptris Pro without the restrictions. You can easily modify and add small details until you're happy. Polypaint is very useful when it comes to adding colour to your piece. The most important thing, however, is to let the sculpt do its magic. All the sculpted details will pick up the highlights. When applying the Polypaint start rough and tweak it with the RGB value of your brush. A little bit of Polypaint can get a big result when it comes to the final image. One of the main ways to create stunning models these days is to sculpt the initial form in programs like ZBrush or Mudbox and then retopologise the sculpt. This is the process where you create new geometry that is more animation-friendly, more predictable with contiguous edge loops and much lower in polygon count, making it more efficient. You can of course do this in Cinema 4D with tools like the Polygon. To make it even better you can download scripts like the HB Modelling Bundle that make Cinema 4D into a perfect retop solution, enabling you to draw new geometry right onto your sculpt. Find a range of options here. Try to blend different types of alphas with a positive and negative value over each other. Try switching out between big ones and small ones to give it a natural blend. Also, for adding veins a small trick that I use is to go down a few subdivisions and draw in the vein – if you step up again, it will blend in perfectly like it's under the surface, instead of laying on top. One aspect of the Move brush is that the falloff tends to create a rounded centre to the brush effect, making it difficult to create a sharp protrusion like a spine, spike or peak. To fix this you can edit the settings of the Move brush. Select the Move brush then go to Brush > Curve and turn on the AccuCurve button. This forces ZBrush to use the brush curve in this menu to define the falloff of the brush. The result as you can see is a sharp, precise Move brush. When using the Smooth brush many users realise how difficult it can be to smooth border edges on poly geometry or single stray points that have been shifted from the original model, as sometimes happens when projecting geometry. Smoothing these geometry types can often produce unsatisfying results. A good tip is to edit your Smooth brush settings to allow the brush to be more effective on open geometry edges and single points. Go to the Brush > Smooth Brush Settings menu and lower the Min Connected slider to 1. The Smooth brush will now be much more effective in these areas. When generating panel loops from polygroups, we often find that the edges of the mask and the resulting polygroup creates an irregular shape to our panel loop geometry. A great way to correct this and give the model a nice machined look is to polish by features. This slider is found under Tool > Deformations. After you have generated your panel loops open the Deformation sub-menu and click on the Radial button on the Smooth by Features slider. This will look like a black dot in a circle rather than a white dot. Now raise the slider incrementally and you will see the edges of your loops clean up and look far more pleasing. Often when I'm working in ZBrush I will make changes to my draw size and in many cases the Dynamic setting on my brush. Previously this setting was global for all brushes, so if you were to make a change to your draw size whilst working in curves it would impact any other brushes in use. In the new ZBrush you can now enable a per-brush Draw Size and per-brush Dynamic mode. Simply enable the buttons at the top of the screen to have far more control over each brush setting. One of the trickiest aspects of adding fine details to a model is finding the best way to fade one texture into another, or to fade out details completely. We want to avoid a uniform 'stamped-on' look. Before I start to add fine details I will store a morph target of my model in its undetailed state by going to Tool > Morph Target > Store MT. Now as I detail the mesh I can use the Morph brush to blend back out to the undetailed surface. This is much better than smoothing because the Smooth brush erases detail while the Morph brush will gently reduce its intensity. It's a much more effective blending brush.